My name is Emily Spence-Almaguer and I am an Associate Professor of Behavioral and Community Health at the University of North Texas Health Science Center. I spend most of my professional time serving as an independent evaluator for community initiatives and conducting assessment studies. I am a social worker by training and have found that the conversational skills used in Solution-Focused Therapy have great application in the realm of evaluation and community assessment. Focus group and individual interviews because they help generate rich qualitative data and great ideas for continuous program improvements. Evaluation planning meetings because they help stakeholders articulate a wide range of potential outcomes and describe how those outcomes might be observed (i.e., measured). Meetings where stakeholders are being debriefed around disappointing evaluation results. The nature of solution-focused dialogues avoids finger-pointing and helps drive forward momentum. It’s all about the questions!! Solution-focused dialogues are driven by questions that promote deep reflection and critical thinking. I want you to take a moment and imagine that you just learned that the Bass [local philanthropist] family recently donated $100,000 to the United Way for this project. They want you to help them figure out how to best spend the money. What is the first thing you would advise them to do? What would you advise them to do next? Expertise: I love the way that Gaiswinker and Roessler referred to this as the “expertise of not-knowing”. In solution-focused dialogues the words of questions and tone of delivery are carefully crafted to amplify the assumption that the stakeholders have exceptional knowledge, skills and capacities. Rad Resource: For an introduction to solution focused concepts, I like Coert Visser’s Doing What Works Blog. Download from the AEA Public eLibrary to View the Poster in Full Size! 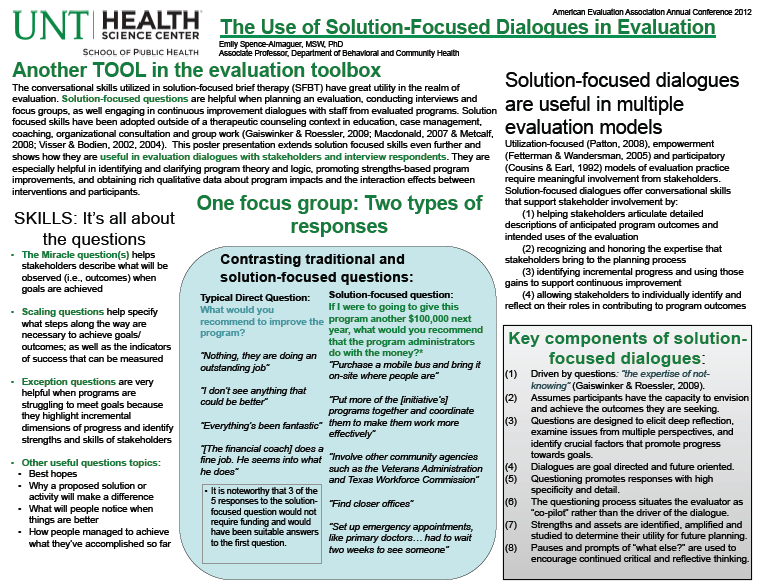 Rad Resource: I presented on Solution-Focused dialogues in evaluation at AEA’s Evaluation 2012 conference. You can download my poster and resources list from the AEA public eLibrary here. Lessons Learned: A direct question, such as “What would you recommend to improve this program?” often fails to generate detailed or meaningful responses. In focus groups with program consumers, I find that this question is interpreted as “what is wrong with the program?” and may lead to comments in defense of the program staff members (see my 2012 AEA poster for an example of this from my data). Many thanks, Emily. This will be a useful tool for both Outcome Mapping (www.outcomemapping.ca) and Outcome Harvesting. I am posting to both communities of practice and wanted to cc you but do not have your email address.